Early last year, I was contacted to produce a documentary film highlighting a visit to Boca Raton, Florida by Alhaji Dr. Muhammadu Indimi, a distinguished and highly successful businessman from Nigeria who is also the sole Founder and Chairman of Oriental Energy Resources Limited, a privately held, Nigerian oil exploration and production company. He was coming to South Florida to receive the honorary degree of Doctor of Humane Letters from Lynn University in Boca Raton, Florida, where Dr. Indimi has sent six of his children. 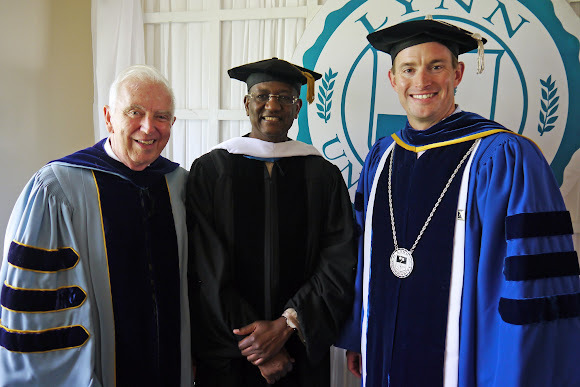 Dr. Indimi was presented with the degree at Lynn University's forty-­seventh Commencement Exercises held on Saturday May 12, 2012. Dr. Kevin Ross, President of Lynn University, presided over the ceremony as well as the awarding of diplomas. Dr. Indimi was joined by over 60 family, friends, and colleagues who came from from throughout Africa, Europe, The Middle East and the United States to celebrate this prestigious event. Dr. Indimi is a noted humanitarian and philanthropist and has received numerous awards as well as honorary doctorate degrees from notable Universities in Nigeria, Ireland and the United States. This short film documents Dr. Indimi's arrival, a welcoming reception at Lynn University as well as the graduation ceremony, a banquet in Dr. Indimi's honor at the lovely Boca Raton Resort & Club, and Dr. Indimi's departure via his private jet. Produced, directed, & edited by "yours truly" and featuring some great music from Cuban guitarist Justo Saborit, French Post-Rock artist Julien Lussiez, and Brooklyn-based ambient outfit The American Dollar.